A fittingly awesome look into one of the best bands out there. The White Stripes: Under Great White Northern Lights is a documentary that follows rock duo Meg & Jack White as they play scheduled and impromptu shows at every territory and province in Canada to celebrate their tenth anniversary as a band. Being a huge White Stripes fan to begin with, I was pretty pumped about this movie. I’m gonna do my best not to turn this review into an excuse to gush over them, but let’s just say if you’ve never listened to Elephant, you’re missing out on the best album of the last decade. But then again, that’s just me, the recovering music snob that I am. Thankfully, this one’s not just an hour-and-a-half of fan service and will even appeal to all you folks who still can’t get “Fell in Love with a Girl” out of your heads. Just ask my good buddy Fred who got dragged along to this, he’ll back me up 100%. But even as a fan, the White Stripes are an interesting band to focus a movie on. Some might write off Jack as spooky at first glance, others might write off Meg as mute well after first glance, and I still have no idea as to whether or not they’re brother and sister or ex-husband and wife or robot assassins sent from the future the rock us into oblivion, yet that’s all part of the appeal. There’s a mystery to the band that’s at once explained and perpetuated as the movie goes on – which I totally dig – but in the end it’s all about the music. And while a good deal of the movie is spent watching them play face-melting shows to masses of eager Canucks, this strangely enough ends up being the least interesting part of the movie. The best parts come in the guerrilla shows they put on in bowling alleys as Jack starts picking up spares inbetween riffs, on city buses as they get all the passengers singing “The Wheels on the Bus”, in a circle of village elders who don’t even speak the same language and on the back of a boat belting out “Catfish Blues” (one of my all-time favs) to the folks on shore. It’s genuinely fun moments like these that elevate the band from their label as “big timers” and it becomes all too clear that for all their success and for all their accolades/criticisms, they really do just love the music. There’s also a ton of scenes with Jack and Meg just talking about their career, their image, music and each other. Unfortunately, Jack finds himself getting a little too hung up on addressing his critics, but once he gets that out of the way, he’s got some seriously funny and down-to-Earth things to say about a band that the public really doesn’t know a whole lot about. Not so much Meg though, she’s pretty quiet, but Jack addresses that, too. Director Emmett Malloy also does a great job of complementing the look and sound of the movie with the look and sound of the band. Nearly everything is filmed in shades of black, white and red, the video quality is vintage and grainy and the cinematography is gritty and raw. It’s pretty awesome how the camera almost feels like the third member of the band after a while, like a real fan is filming it. Good stuff. Now, I don’t know how successful I’ve been in convincing any of you non-groupies out there to go check this out, but if you’ve made it this far, I’d say give it a shot. The White Stripes really are a great band – easily in my Top Five – and even though the live stuff from their scheduled shows here isn’t as awesome as the show they put on in their first concert DVD, Under Blackpool Lights, I still think you’d be hard pressed not to appreciate how effing awesome they are. 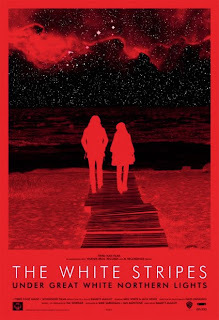 Under Great White Northern Lights is just a cool freakin’ movie and a lot of that is because The White Stripes are just a cool freakin’ band. Whether you’ve got their whole discography booted up on your iPod or just like running to “Seven Nation Army”, this is a great introduction to a genuine band that seems to have gotten mistaken for their image over the years. And as a kind of bonus, CHECK THIS OUT. Best White Stripes song, best version of it I’ve ever heard. Awesome, awesome stuff. Seriously, how many movies need to be made about this band? Yeah, I like Fell In Love With A Girl as much as the next guy, but theyre good at making noise. And thats about it. I’ll back you up Aiden, I think The White Stripes is the greatest band working today and Elephant is in fact, the best album to have come out of the past decade. I don’t think that is any exaggeration either, fan or not. That aside, I’d like to say I liked the review and can’t wait to see this. Incredibly interesting people. Glad you dig Jack and Mag, hope you dig the movie, too.